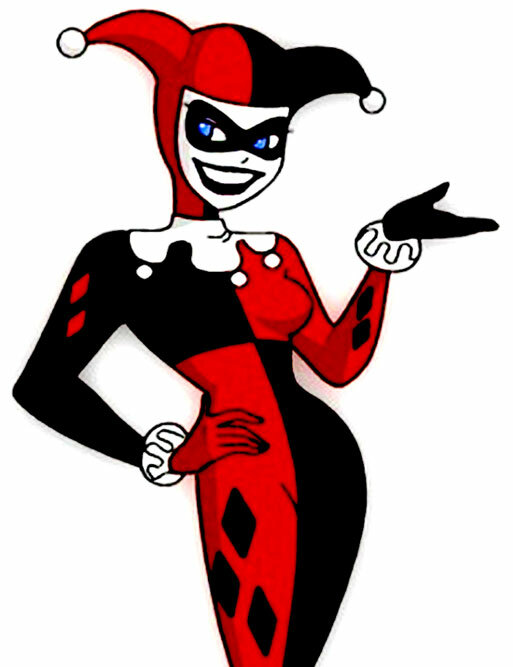 Later this year DC’s beloved villainess/anti-heroine ‘Harley Quinn’ will be somersaulting onto the silver screen via a Suicide Squad comic book adaptation, and the internet is already awash with appetite-whetting trailers and promo pics of Margot Robbie in costume… so I figured I’d take a little trip back in time to the character’s origins as a cartoony side-chick in Batman: The Animated Series (1992 to 1995). 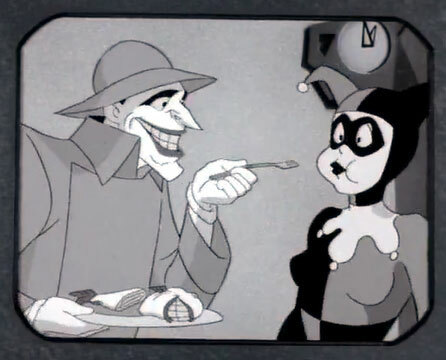 Harley: Oh my poor, poor puddin’. Bullock: Come on, he was a demented, abusive, psychotic maniac. Harley: Yeah. I’m really going to miss him! It’s actually kinda sad how many other characters (goodies and baddies alike) tell her she deserves better, over and over again throughout the series, but she just never seems to believe them! Of course, that pathos is part of her charm… and there is some evidence to suggest that the message was starting to get through by the end of the show’s run, thanks in no small part to her budding friendship with ‘Poison Ivy’ (Diane Pershing). 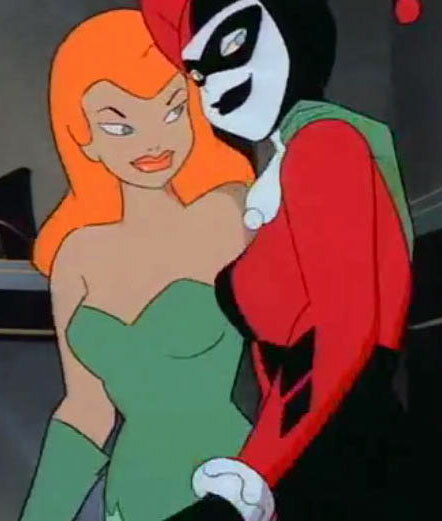 The two feisty femmes first “meet cute” in ep #1.47 (“Harley and Ivy”), after the former has been ousted from her boyfriend’s gang (for accidentally handing him a joke gun, during a tense shoot-out with the Batmobile) and set about stealing a namesake diamond from Gotham’s Museum of Natural History, where the latter also happens to be purloining poisonous plant specimens. When Ivy accidentally triggers an alarm in her part of the building, the two of them are forced to team-up to evade the incoming police officers, speeding away in Ivy’s cleverly-concealed getaway car, then holing up in her secret hideout situated at the heart of a toxic waste dump. Ew! 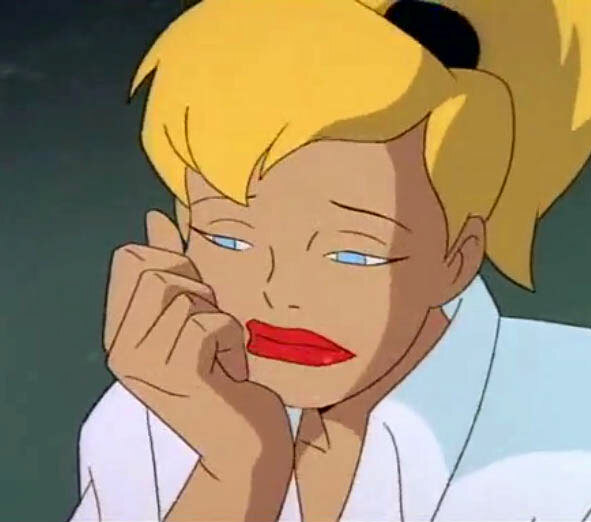 To protect Harley against the harmful effects of this undesirable environment, Ivy injects her with a home-brewed immunity booster, which in later continuity is also credited with giving Harley enhanced strength and stamina. Hurrah! Sadly, Ivy’s attempts to cure her new gal-pal of a lingering love-sickness for “that psychotic creep” are far less successful… though the two of them do enjoy some solid “girl time” together during their successful crime-spree montage. Inevitably their felonious brand of feminism attracts the attention of both Batman and a jealous Joker, but they manage to “stick it” to the menfolk several times before eventually being brought down by the G.C.P.D.’s own crossover queen, Dt. ‘Renee Montoya’ (Ingrid Oliu)! 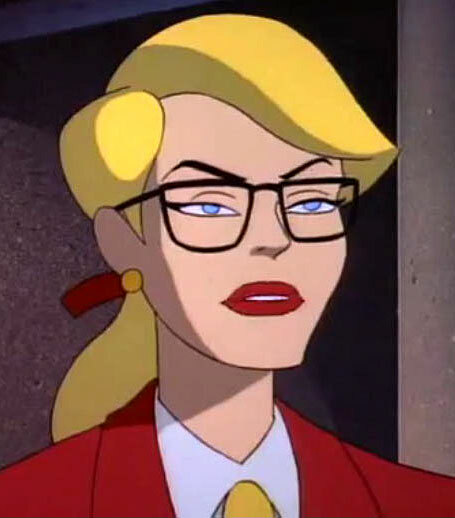 This episode is also notable for being the first to use Harley’s real name, “Harleen Quinzel”, although it does set-up something of a retrospective continuity snafu… in the sense that, within the context of the story itself, it’s a pseudonym she uses while posing as a lawyer to spring a prisoner from the police station. As a (frequently) convicted criminal, it would have been totally implausible for her to use her actual birth name in that situation (especially since Bullock is the detective she’s duping, and we’ve already seen him arresting her in a previous story)… but presumably when this episode was written, no one knew that it would eventually become established as her actual factual birth name, rather than a cunning off-the-cuff alias…? Meanwhile, there’s more evidence of The Joker’s aggressive disregard for his devoted aide de camp when he grabs her roughly by the collar and shoves her to the ground, as punishment for assuming he was joking when he ordered her to return a stash of stolen jewels, that they’d nabbed in the hope of luring the “late” Batman out of his supposed grave. Feh! This entry was posted in Rants about TV and tagged Adrienne Barbeau, Arleen Sorkin, Batman, Batman: The Animated Series, Catwoman, Diane Pershing, Harleen Quinzel, Harley Quinn, Harvey Bullock, Ingrid Oliu, Kevin Conroy, Margot Robbie, Mark Hamill, Pamela Isley, Paul Dini, Poison Ivy, Renee Montoya, Robert Costanzo, Suicide Squad, The Animated Series, The Joker. Bookmark the permalink.